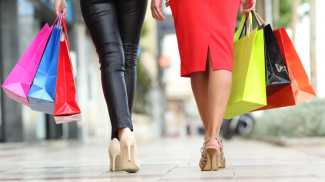 After analyzing consumer spending at more than 1.3 million merchant locations in the U.S over the holiday shopping season, FirstData (NYSE: FDC) has revealed it was the strongest in four years. 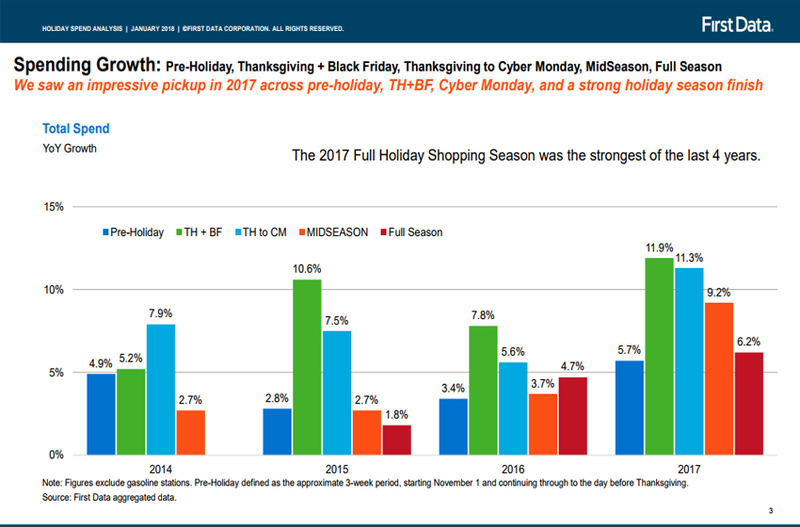 First Data’s SpendTrend Report shows the overall growth for the entire holiday season was up 6.2 percent from the previous year, which was at 4.7 percent. Spending in retail and ecommerce were also higher across categories and regions around the country. 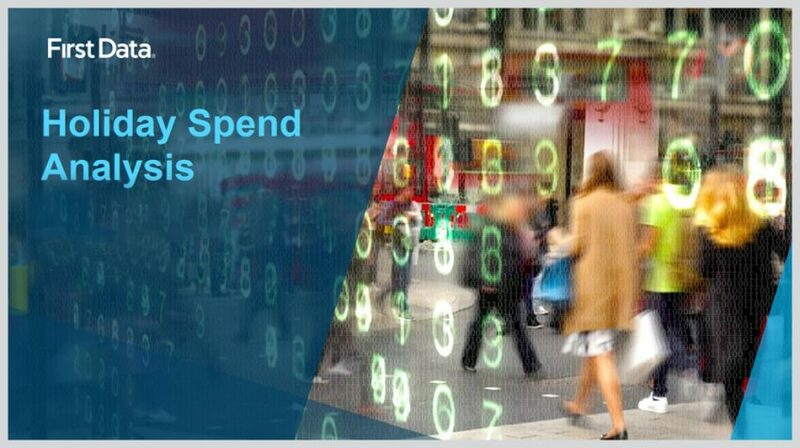 The data collected in the SpendTrend Report is extensive, covering businesses of all sizes in both brick-and-mortar and ecommerce transactions. According to FirstData, this includes mom-and-pop type shops. The report reinforces similar positive conclusions drawn from other data coming out earlier in the season. So what was responsible for this growth? Glenn Fodor, Senior Vice President and Head of Information and Analytics Solutions at First Data, attributed the positive results to several factors. In a press release, Fodor said everything from low unemployment, high consumer confidence, a soaring stock market and even good weather conditions during the shopping season were in part responsible. 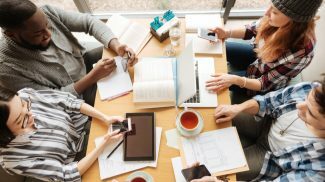 When you break down the overall growth, retail ecommerce was the big winner with 10.4 percent growth compared with 4.0 percent growth for brick-and-mortar outlets. Transactions were also higher for ecommerce coming in at 12.8 percent compared to just 2.0 percent for brick-and-mortar. Where brick-and-mortar fared better was in average ticket sales, going up by 1.9 percent while ecommerce was down by 2.1 percent. As far as categories, electronics and appliances experienced the highest growth at 8.6 and 6.9 percent respectively. Sporting goods, hobby and book segments, on the other hand, were the only categories with a decline of 0.6 percent. The numbers for the US were high in all regions, but the Southwest and New England regions showed the fastest growth at 5.7 percent and 5.5 percent respectively. The lowest growth rate came from the Mid-Atlantic region at 0.7 percent. The First Data SpendTrend Report collects merchant processing data only from card-based payment. 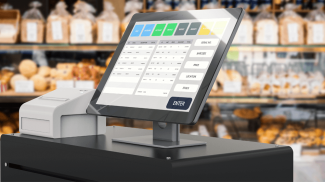 The 1.3 million U.S. merchants were serviced by FirstData for at least 13 months, which serves around six million business locations and 4,000 financial institutions in more than 100 countries around the world. These merchants were open for business between October 28, 2017, and January 1, 2018, the period FirstData identified as the whole holiday shopping season. I thought that it had gone down. I guess spending is just increasing over the years. I guess spending is expected to increase in the upcoming years. This means that spending power is also increasing. I think that preparations for the next holidays will be earlier. They are now doing it on August but it will be earlier this year.